Sunday, July 29, will mark the annual national St. Vladimir’s Day Celebrations, in honor of the Baptism of the Russian people into the Orthodox Christian Faith by St. Vladimir. 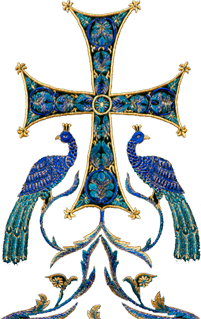 It is to this momentous occasion that the Orthodox faithful of the Russian land owe their entire cultural identity, while non-Russian Christians in many lands the world over owe to it their illumination in the bosom of Christ’s Church. In accordance with Diasporan tradition, the national celebrations in honor of St. Vladimir – the founder of Holy Russia and the first of the Russian saints ‒ will be held at St. Vladimir Memorial Church - 134 Perrineville Road Jackson, NJ 08527. Divine services will be led by the First Hierarch of the Russian Church Abroad and ruling bishop of the Eastern American Diocese, His Eminence, Metropolitan Hilarion, co-served by His Grace Nicholas, Bishop of Manhattan, and clergy of the Church Abroad. You are cordially invited to join us for the St. Vladimir’s Day Celebrations! 6:00 PM: Bishop Nicholas will serve All-Night Vigil at St. Vladimir Memorial Church. 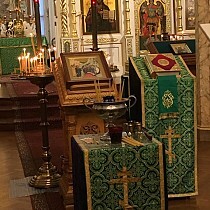 9:30 AM: Bishop Nicholas will celebrate Divine Liturgy in St. Vladimir's Church. 6:00 PM: Metropolitan Hilarion will serve All-Night Vigil at St. Vladimir Memorial Church, co-served by Bishop Nicholas. 9:00 AM: Hours. Clergy should be vested in white vestments by 9:00 AM. A temporary vestry will be set up in the lower St. Olga’s Church. 9:30 AM: Greeting of Metropolitan Hilarion, followed by Divine Liturgy. A grand procession will be held after the Liturgy with the blessing of water. 12:30 PM: Group photo in front of St. Vladimir Memorial Church. 1. Turn onto Freehold Road. Head 3.3 miles. 2. Turn left onto Cedar Swamp Road. Head 1.0 mile. 3. Slight left to stay on Cedar Swamp Road. Head 1.3 miles. 4. Continue onto Siloam Road. Head 2.8 miles. Continue to follow County Rd 537 E. Head 3.9 miles. 6. Turn left onto Gibson Place. Head 0.1 miles. 7. Turn right to stay on Gibson Place. Destination will be on the right. 1. Head southeast 0.1 miles on Perrineville Road. 2. Continue onto County Road 571/Cassville Road. Head 0.5 miles. 3. Turn left onto County Road 528 E/W Veterans Highway. Head 2.4 miles. 4. Turn right onto County Road 528 E/E Veterans Highway. Head 5.4 miles. 5. Turn right onto Cross Street. Head 2.9 miles. 6. Turn right onto U.S. 9 S/River Avenue. Continue to follow U.S. 9 S. Head 0.6 miles. 7. Turn left. Destination will be on the left. 1. Head southeast on Perrineville Road. 2. Continue onto County Road 571/Cassville Road. Head 249 feet. 3. Turn left onto Thompson Bridge Road. Head 315 feet. 4. Take the 1st left toward Thompson Bridge Road. Head 459 feet. 5. Turn right onto Thompson Bridge Road. Head 476 feet. 6. Turn right onto County Road 571/Cassville Road. Head 4.2 miles. 7. Turn left onto County Road 537 W/Monmouth Road. Head 0.4 miles. 10. Turn right. Destination will be on the right.